Dine at one of newest downtown spots – Main Street Pint & Plate. 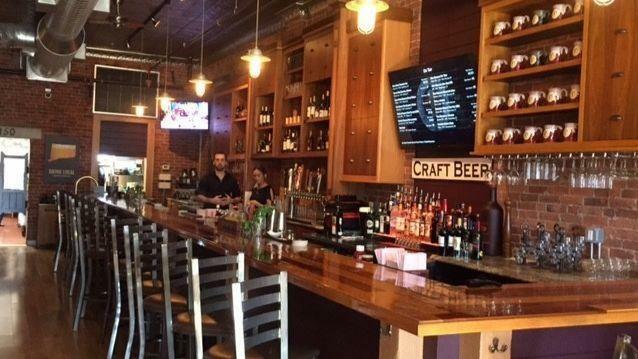 Located at 182 Main Street in downtown Bristol, Main Street Pint & Plate has a relaxed atmosphere and serves the most popular libations including mixed drinks, IPA ,and traditional beer brands. Owners J.R. Rusgrove and his wife Leanne J.R. Rusgrove has loaded the menu with comfort food, such as pub fries, chicken wings, meatloaf and barbecued meatballs, and less traditional items, such as “vegan BBQ ribs.” The bar and restaurant combination features a diverse menu of traditional American culinary options created by Chef Drew Osborn. Head bartender Eric Smith said the beer list will also include a couple of offerings from Firefly Hollow Brewing in Bristol.